2 Glue the template sheet to the back of a sheet of black construction paper. 3 Cut out all of the white from the template. You will be left with the nativity border shape. 4 Place the nativity shape onto a self-laminating sheet or contact paper, construction paper side down. 5 Fill the inside with colored tissue paper. 6 Cover with another sheet of self-laminating sheet or contact paper. 7 Cut out the sun catcher from the laminating sheet or contact paper. 8 Stick the sun catcher to your window with double-sided tape. 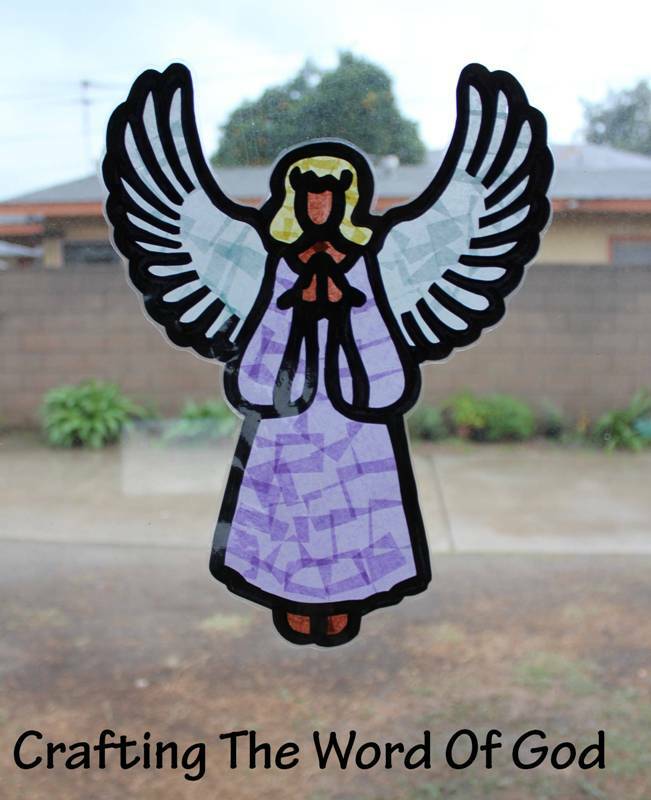 This entry was posted in Bible Crafts, Christmas, Holiday Crafts and tagged angel, baby Jesus, bible craft, Christmas, Christmas crafts, Jesus, Joseph, lamb, manger, Mary, nativity, sun catcher. Glue the antlers onto the reindeer head. To finish assembling the mask either, glue a large popsicle stick to the bottom of the mask to be used as a handle, or use the provided straps to be able to secure it on your kids head. This entry was posted in Bible Crafts, Christmas, Holiday Crafts and tagged Christmas, Christmas crafts, Christmas mask, crafts, holiday, mask, reindeer, reindeer mask, Rudolph, santa. Cut out all of the white from the template. You will be left with the wreath border shape. Place the wreath shape onto a self-laminating sheet or contact paper, construction paper side down. Fill the inside of the wreath with colored tissue paper. Cut out the wreath from the laminating sheet or contact paper. This entry was posted in Bible Crafts, Christmas, Holiday Crafts and tagged activity, berries, Christmas, Christmas crafts, Christmas sun catcher, Christmas wreath, crafts, holiday, sun catcher, wreath, wreath sun catcher. This entry was posted in Bible Crafts, Christmas, Coloring Page, Holiday Crafts, Printables and tagged candle, Christmas, Christmas coloring page, Christmas crafts, holiday, tree.